Many authors and business are confused about ISBNs for self-published books. What is an ISBN? Do you need one? Where do you get it? Can you use a free one? We’ve written the Self-Publishers Guide to ISBNs to answer your questions and clear up any confusion. What exactly is an ISBN? The ISBN (International Sales Book Number) is a 13-digit product number used by online retailers, bookstores, publishers, libraries, and other supply-chain participants for ordering, database listings, sales records, and inventory control. Originally developed as an inventory control tool for print books, ISBNs have been around since 1972. The ISBN identifies the registrant (author/publisher) as well as the specific title, edition and format. ISBNs have a number of uses. Book databases use them to track books. ISBNs allow buyers and readers to find your books. They are required for sales to bookstores, for library sales, and for listing in directories such as Books in Print. Finally, ISBNs can be useful in helping buyers understand exactly which version of a title they are purchasing. By the way, don’t confuse the ISBN with the barcode. 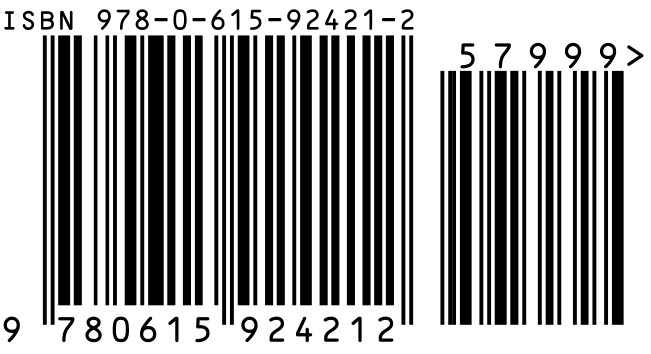 A barcode is a graphical representation of your ISBN number that also includes the price. Major book retailers and wholesalers require that books have barcodes so they can be scanned for inventory and sales tracking purposes. Do self-published books need ISBNs? Self-published authors often ask us if they need ISBNs for their books. You will need one for printed books, including print on demand. If you upload a print file to CreateSpace or IngramSpark with no ISBN, they will assign a free one and forever be listed as the publisher on record. How many ISBNs do you need? *What is a new edition? Basically if you update an existing book sufficiently that readers will notice, then you’ve created a new edition, which requires a new ISBN. You don’t want to confuse and irritate consumers, especially with reviews at stake. It may be tempting to use the free ISBNs provided by CreateSpace or other service providers, but don’t do it. ISBNs are non-transferable, which means the service provider will be listed as the publisher of your book, not you. You don’t want that. It won’t affect copyright or registration…you’d still own the rights to your book. But it does affect how your title is listed in the databases that power the sales and distribution system. You may lose control of your metadata. And you’ll definitely come across as rookie author. The same applies to self-publishing companies or distributors that include ISBNs in various packages. That’s a huge red flag. If a company you’re considering working with offers to give you an ISBN or to sell you one at a discount without making it clear that they will be listed as publisher, run the other way. Unfortunately many companies prey on inexperienced authors who don’t understand how publishing works. Don’t be a victim. If you want to be listed as publisher, buy your own ISBNs.